(This picture always kind of made me laugh, because all of the pictures of our for-sale house were beautiful and really professional, and I just kind of wondered why the photographers didn't just pull out the laundry room clutter or at least the hanging clothes when they snapped the photo). Ha. - Flipped the original white wire shelf upside down and reinstalled at an angle, to hold laundry baskets. This last shelf was the part I really wanted to share with you if you are the proud owner of a laundry closet. My Dad installed a shelf this way in my Mom's laundry room (as far as I know he thought it up), so I got Matt to put one in ours too. I took a closer picture of the upside down install, and they had to saw/cut the openings in the support brackets a little and bend a bit to adjust the fit. (Basically, just play with it to make it work). *Update: In response to lots of questions regarding this hack: the wire shelf pictured is 20 inches deep (like this one available at Home Depot), and the support brackets are 20 inches (like these, also available at Home Depot). I am not much of a hamper person. I prefer to drop off dirty laundry in the laundry room, so having baskets in there was a must. We use one for lights, one for darks, and one for special wash. As we add more laundry to our family, I might need to tweak our system (maybe each kid has a hamper in their own room? ), but we'll get there when we get there. I would love it if Matt would paint back over the new (but still broken!) cable line (hint, hint), and I want to cover up the plug and outlet with a little "lost socks" artwork/system like this one I pinned on pinterest. Happy laundering! Any other ideas for laundry closets? I bragged on ya'll about that laundry room idea. So inventive. If we ever redo ours, I'm stealing. I love how people write. Fail. I get ENVY when I see people who actually have laundry rooms. I mean rooms -- like the size of a room. Unlike my side by side in the hall. Fail. Note: I'm reading these posts out of order -- youngest to oldest so, my comment above, is counting on you to read my posts in order. I also have a "fail" for a laundry "room" and I use the word "room" quite loosely! LOL! I have my w/d on one wall, a single closet on the left wall, and on the right our back door. I hate utility rooms that are an after thought! WHEN we build, I know I exactly what I am building...until then, THIS is on my hubby's to do list!!! this is great!! can you tell me what size shelf & brackets you used? Is there a way to send a pic of the bracket where you cut it. Hate to bust another one when they are 6$ a pop. love your post & your ideas, especially the upside-down tilted shelf. Would like to suggest that you put a metal lid (like a cookie tin?) over your electric socket rather than your sock hanger. You don't want to add a fire-starter source to your laundry room. I suppose you could attach your sock thing to the outside of the tin for decor (or paint an interesting sign on it - or just use a decorative tin). I attach a delicates bag to each of my four laundry baskets (darks; whites; colors-blue/green; colors-red/yellow) - I rarely wash separate delicates loads, so having the separate bags makes washing them (most of the time) with regular loads easier. Sorting is done as dirty laundry is put in the closet (& people empty their pockets & zip zippers, too). Also - my baskets are the size of my washer capacity, so when the basket's full, it's time to do that load. Good idea on the tin, Mimi. 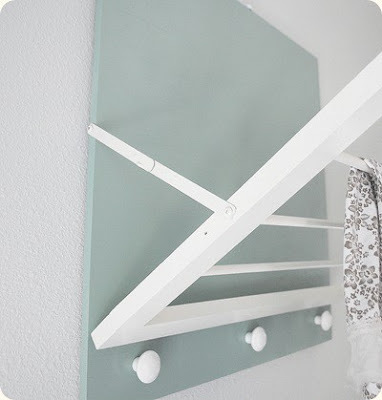 Great laundry organization ideas too! Thanks. I love this basic and very organized concept! It would easily improve my current "non-existent" organized laundry room! I also like MiMi's idea of having baskets that are the size of my washer capacity. 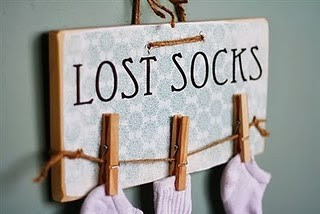 I would ADD a mesh SOCK BAG to each laundry basket for ALL SOCKS TO BE PLACED in when taken off and then washed, dried and given to the person to whom they belong (name or color coded for each family member). Great Ideas!! Just found your blog from a pinterest pin. I love this idea and it is just what I needed to see. I also am jealous of those gorgeous, big laundry rooms when I see them, but I don't want to dedicate all that floorspace to laundry! Having a small laundry area does make it imperative for me to keep the laundry done too. I loved this idea so much, I just had a shelf installed over my washer/dryer like it!! I didn't do the caddy though. I have front loaders with the pedastals so I didn't have the space. I am so excited for the organization!!! Love this idea with the shelf. I am one of those people who has a laundry basket in each child's room (3) and although it works really well for me I always seem to be in need of an extra one! Do you know what style shelf you used for the flipped angled shelf? Or where you bought it? We can only find the tight mesh in 20" depth but I don't think tight mesh will work with the braces. The regular/linen style we can only get in 16" depth. Also, we are having trouble figuring out how to get the braces to fit so they support the shelf when it's flipped over. I know in previous comments you say you have to cut. Can you provide anymore specific details? Thanks a lot!! Chris, Any luck with finding the shelf? I love this idea but not sure what type of shelf to get. Sorry about the late reply... Our shelf and brackets were both from Home Depot (both "20 inches," although the brackets actually measure close to 19 inches). I think it was a ClosetMaid brand shelf (also see picture). The best my husband can remember is that they had to cut at the openings a bit and maybe bend a little until it worked. I hoped that helped. I did add a couple of links to 20 inch materials in the post. Do you know the angle the shelf is at? my garage holds my laundry and I am forever trying to organize that area hoping this will help! ! The angle will be determined by lining up the flipped shelf to fit the bracket, if that makes sense. Good luck! Yes! Where did you get the shelf? The deepest we can find is 16". Would love to find 20". Laura- Our shelf and brackets were both from home depot, although that was some time ago. Looks like you can still find both there-- I added links in the text above, in case that is helpful. Good luck! We just did the slanted shelving and the upper wall anchors shown will require modification to fit properly with the upside-down, thinmesh shelving. We changed to the strap anchors for the uppers. The metal supports also do not fit the shelving once it is upside-down. The "ears" must be removed and the "u-groove" must be elongated. A Dremel with a cutoff wheel does this easily but the shelf will not attached securely even with this mod. We used nylon, cable-ties (zip-ties) to keep the shelf securely attached to the brackets. After all was done, we would not have done this project had we known we were working against the shelving system's design as it is not intended to be used upside-down! Hi there. I am in the process of doing this project right now! Our laundry room is tiny, and getting our current laundry sorting system out of the way will make it look so much larger. I do have one question, please. I'm a little concerned about the baskets falling off/forward once clothes get put in them. Do you have any problems with the baskets coming off since the lip of the shelf is so shallow? Thanks! Hi Chanda- I've bumped an empty basket before and had it jump the lip, but have never had one fall with anything in it to weight it down. :) Hope that helps! Awesome, good to hear! I guess that's good considering I'm about halfway through the project, lol! Thanks so much for your reply! do you recall where you purchased the small storage shelf? or the name/make of it? I don't recall any of the specifics- sorry! I'm sure I just happened upon them in the shelving/organization section of a home improvement store or Walmart/Target type store, but that was 7 or 8 years ago. Hope you find something perfect for your current need! Hi:) I also want to thank you for sharing this project. I fell in love with it ever since the first time I saw it on Pinterest. I especially wanted to do it because I have the same style laundry closet in my house. Also, I wanted to share some info in hopes of answering some of the questions previously asked. I used a 16" shelf and 12" support brackets (both from Lowe's), the 16" support brackets put the shelf at a very steep angle and I didn't like it. So I used the 12" ones and instead of attaching them to the outer edge of the shelf, I put them against the middle of shelf. That seemed to work better for me, because when I put them on the edge they kept slipping off and would leave the shelf just kind of hanging in the air. I did have to do some adjusting to the support brackets like you mentioned. I cut the middle groove a little longer and bent the c-shape thingies until it fit right on the shelf.The small storage shelf I found at Home Depot for $17. It's called a "Hanger Shelf" and you also have to put it upside down from it's original intended use for it to fit this project. I like it upside down better anyways:) Hope this helps someone out!! I have pics of my end result, but I don't know how to share them on here. If I figure out how to do so I will post them!! Thanks again!! We just finished this project. My husband and I were thrilled when we found the website featuring this laundry closet. We had similar circumstances with nowhere to store dirty laundry. It was inconvenient and frustrating. We love, love, love the finished product. We did add a few features to ours though to fully benefit our situation. We installed the wire shelves and also installed a full countertop (which had to be special ordered to get the correct size, but on sale thru Menards it was pretty reasonable). The wire shelving and the countertop had to be installed higher than the one shown here since we have laundry drawers underneath our larger, front load machines. Anyone much shorter than my 5'6" self should probably not use this method if they also have laundry drawers that raise the height of the machines. Future owners of our home could remove the shelf and just set the baskets on the countertop instead if necessary. That would work well. But fortunately the wire shelf works great for us. We also had a hard time understanding how to attach the shelf to the brackets so we put them in place and ziptied the shelf and bracket together. It is a very secured finished product since we used very strong zipties and looks nice and clean. Its not obvious that it is ziptied. My husband used black zipties though so we will soon be replacing them with white. We also had the problem of our existing closet bi-fold doors and the machine drawers hitting when we opened the drawers so we replaced the doors (due to a crack in the old one) and installed brackets that we found online called "full-access bi-fold door brackets". They allow the doors to open fully out of the door frame. This gives us total access to the entire opening and it is great. We were also able to find the perfect size laundry baskets and are able to fit 4 of them across the shelf. We would like to post pics of the finished project but can't seem to figure out how. Please let me know if there is a way. Update: Months later and we still love the results of our laundry closet. This layot has totally resolved our problem of where to store dirty laundry and had made washing clothes 100 percent easier. I wish I could post a pic to show it. We are so thankful that we found this website. It's an awesome solution to a frustrating problem. Thanks for posting it. Thank you for the detailed information on shelves and shelving! I loved this idea so much, I just had a shelf installed over my washer/dryer like it!! Save some time by having us do your laundry for you. You'll love our service.Wedolaundry is an easy and on demand laundry service,With years of experience and best laundry machines and 100% eco friendly detergents.